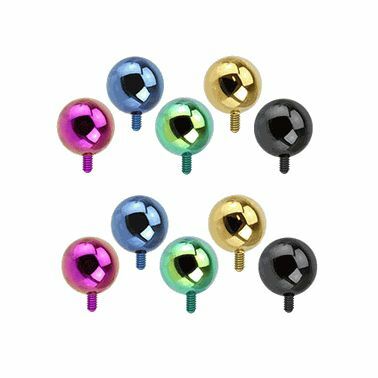 This is a 10pc package of cool anodized titanium dermal top balls. This dermal top ball will fit into any 14 gauge dermal anchor. Anchors are sold separately. Choice of 3mm, 4mm, or 5mm. This package includes 2 of each color, the colors available are purple, blue, green, gold, black. Item is nickel free. You will receive 10 pieces of titanium dermal anchor tops.